Back to the arcade takes you on a trip to the pop culture of the 80’s & 90’s. This exhibition around geek culture takes place in the Dauphine market and gallery in the Paris flea market. 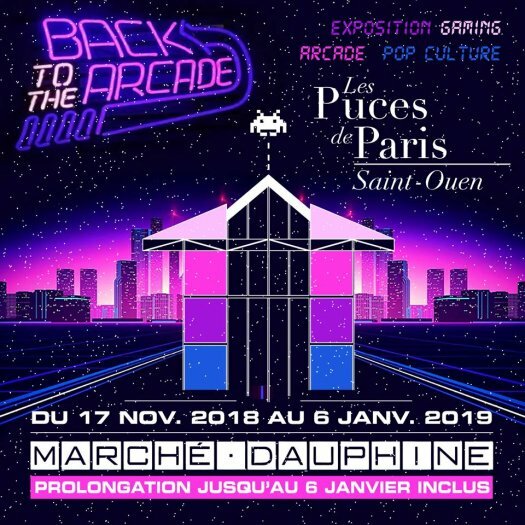 The dauphine gallery will be transformed into a genuine Arcade with vintage games, a giant Gameboy, some legendary games and original artpieces by Anti Factory and Thierry Beaudenon. You will also see some artistic creations C’est l’invasion (we are invaded) inside Dauphine market, a selection of video games in the different market booths, workshops and demonstrations with artists and tattooers. Do not miss the shop Vintage Game Room where you can buy games consoles, accessories and video games from the 80’s & 90’s such as Gameboys, customized NES’, Super Nintendo, Super Mario, Donkey Kong, Pokemon, Zelda... and figurines from animated movies such as Goldorak.